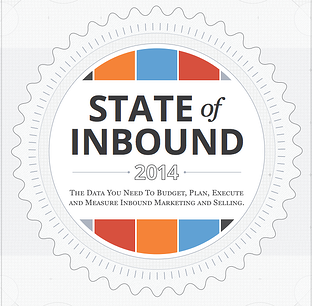 Recently HubSpot published their 6th Annual Report on Inbound Marketing and Selling titled, State of Inbound 2014. In this report, they surveyed more than 3,500 marketing and sales professionals at all levels, across all industries and around the world. Impressive, eh? When surveyed, individuals were asked what they do, why they do it, how they do it and if it's working. HubSpot created more than a report with data and numbers for us to understand where inbound marketing is, they went as far as outlining the marketing stories of these individuals as well! You see, marketing isn't just a task you work toward checking off your to-do list. Marketing is a journey for both the marketer and the prospect. It paints a picture of your business, tells the story of what you do, answers questions for the visitor and provides peace of mind for the prospect. You need to fully understand where marketing is and where it's going, if you want your business to follow suite. That's why we've waded through the mass of information provided from the 54-page report to bring to you the most important takeaways and the most surprising facts so you can put them to use immediately. 1. Inbound unlocks ROI; ROI unlocks budget. Inbound marketers who measure ROI are 12X more likely to be generating a greater as opposed to lower year-over-year return. No single factor has a greater impact on budget (postive or negative) that did "past success with inbound." 2. "Getting found" is priority #1 (and #2 and #3) for high performers. High performers are emphasizing programs designed to get their content found and by extension their company. In order, blogging, organic search and content amplification top the list. Strong alignment exists between marketing practitioners and leaders when it comes to top marketing priorities by role. Marketing agencies are outpacing vendors by sourcing 47% of all leads through inbound channels. 5. The era of "inbound selling" has arrived. More than 25% of respondents reported that their organizations' sales teams practice inbound. 6. The belief that European marketers trail their North American counterparts is unfounded. Many marketers believe that the U.S leads the world in terms of marketing innovation. Unfortunately, that statement doesn't hold true. In reality, more companies in Europe, the Middle East and Africa do inbound marketing and see ROI from inbound. Inbound budgets positively correlates to the presence of Service Level Agreement (SLA) between marketing and sales. Running inbound positively correlates to higher marketing budgets for mid-sized companies. European marketing agencies are outpacing their North American counterparts when it comes to producing top-of-the-funnel (TOFU) content. Nearly 6/10 marketing professionals consider content marketing to be a subset of inbound marketing. Marketers should think in terms of "and" not "or" when it comes to content and inbound. Inbound is not limited to marketing - sales and service professionals have begun to implement inbound practices. 45% of respondents cited inbound as their primary source of leads. Small companies are more challenged by fundamental needs, like managing their website, whereas larger companies are hampered by more strategic issues, such as hiring and internationalization. The number one marketing priority is lead generation (24%) followed by lead conversion (21%). ROI is the top marketing challenge - but it isn't a high priority for most marketers. Inbound-sourced leads are consistently more knowledgeable about the company prior to speaking with a rep than leads sources through outbound means. 84% of inbound marketers cite organic, top of funnel sources (social media, blogs, SEO) as rising in importance. Sales professionals are nearly 7X more likely to value organic, top of funnel sources. It's not the size of the company thst shapes inbound practices, but rather the outlook of the marketing team. Tactics you should establish or accelerate first: blogging, SEO & content distribution. B2B companies place higher value on educational formats, like webinars. Marketers that measure inbound ROI are 17X more likely to see the same or greater ROI over the previous year. Marketers who have prioritized blogging are 13X more likely to enjoy postive ROI. Leads sourced through inbound practices are consistently less expensive than outbound leads. The avergage cost-per-inbound lead, regardless of company sized, was more than 50% less than that of outbound leads. It's in the data - inbound isn't just marketing anymore, it's translates across departments. Not only is inbound diversifying, it's becoming less-expensive while helping you to increase your returns. Still unconvinced about the power of inbound? If you make the switch, you'll finally be able to report a numerical return on investment for your boss - we're sure that'll make them happy.